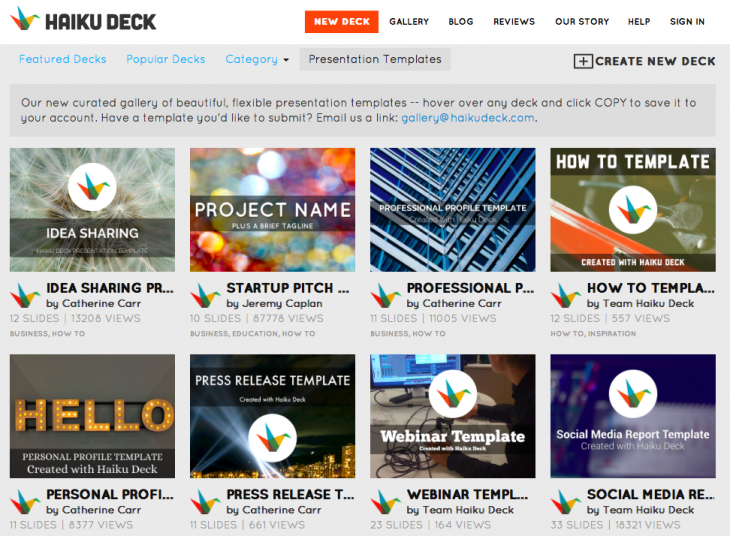 Web presentation tool Haiku Deck has unveiled its secret master plan. The company, which also has iPhone and iPad apps, has built up a library of over three million slide decks since it launched three years ago. And it had a plan for them the whole time. The company is now using all that data it’s collected to power the artificial intelligence and machine learning behind its new tool – Haiku Deck Zuru – which can automatically generate new presentations. Starting in late spring, Haiku Deck Zuru users will be able to import an outline from Evernote or existing file from Powerpoint or Keynote and instantly create a new presentation. Zuru analyzes the content using natural language processing, identifying keywords to recommend images and fonts in a new slide deck. Tratt demonstrated the technology to me using an outline created from a TNW story and the software created a decent slideshow with appropriate images and layouts. The tool bases its picture choices on an analysis of search terms and image selections on Haiku Deck over time, which means it should get better as the amount of data it draws upon increases. Haiku Deck is also using computer vision techniques to analyze the pixels in the images chosen by Zuru to work out where it should place the text. Once you’ve generated a presentation, you can edit and refine it on the Web or through Haiku Deck’s iPhone app. You can also export your creation as a PowerPoint file. While Haiku Deck’s existing apps will remain free, you’ll need a subscription to take advantage of Zuru. The company’s making it available for $30 a year to users who sign up for its pre-sale now but it’ll jump to $60 after that. As well as launching Zuru, Haiku Deck’s updated its core app with the ability to remix publicly shared presentations on its platform, a new gallery of presentation templates, more slide layouts and the ability to pick custom background colors.